Armadillo Sec are delighted to announce that two of our fantastic team have been selected by the CREST Award Committee to receive a CREST Fellowship. 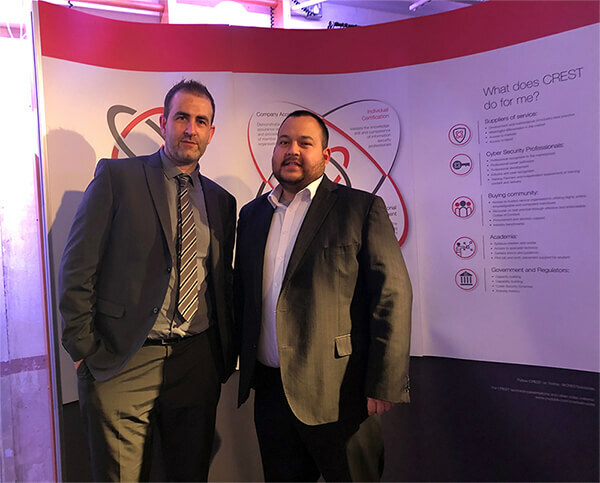 Managing Director Daniel Compton and Principal Consultant Luiz Simpson were both selected to receive the CREST Fellowship and they attended the CREST Fellowship Awards on Thursday 22nd November to receive these in person from Ian Glover, the president of CREST. CREST Fellowships are awarded in recognition of an individuals outstanding level of commitment to the technical information security industry and the highest level of excellence in CREST examinations. A CREST Fellowship is awarded for life and allows the individual to use the CREST Fellowship title in personal and business activities. We are very proud of both Daniel and Luiz and congratulate them on their achievement. Armadillo Sec Ltd are now a G-Cloud 10 framework approved supplier in the Crown Commercial Service Digital Marketplace.